Harm resulting from improper or negligent treatment may be the administering hospital’s responsibility. However, if a doctor is merely practicing out of a hospital but is not employed by the organization, the facility will not be liable for damages resulting from that particular physician. If a paramedic, medical technician, or nurse under hospital employment is at fault, the hospital may be liable. A skilled malpractice attorney, like Honolulu attorney Dennis W. Potts, can look at your case to determine if a hospital should be held accountable for your suffering. Hospitals are responsible for negligent acts performed by any medical staff directly employed by the hospital itself. If a hospital employee was performing a function of his or her job when negligent, the hospital is often responsible for compensating parties injured by the event. If, however, the employee whose negligence resulted in injury or harm was operating under the supervision of a physician not in the hospitals employ, that physician, and not the hospital, would be responsible for compensation. There are certain conditions that must be met for this to occur. For instance, the doctor must be present at the time of the event and he or she must have been able to prevent the employee’s incompetent behavior. While some doctors are directly employed by the hospital, a majority of them are not. Most doctors operate as independent contractors, meaning they (not the hospital) are held responsible for any negligent care on their part. Even if the malpractice occurred within the hospital, if the party at fault was a non-employee doctor, the hospital would most likely be protected from any liability. There are exceptions to this law, however, which should be considered when determining the rightful party to file a claim against. If a non-employee doctor appeared to work for the hospital. 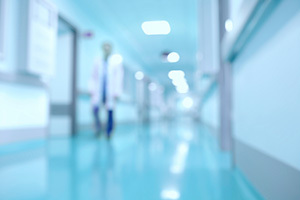 If the hospital does not take the necessary steps to make it clear that the patient’s physician is not a hospital employee, the hospital may still be liable for damages. Often, this information will be contained within the hospital admission forms and does not need to be expressly stated, if they are signed by the patient. Emergency rooms, however, rarely utilize admission forms. If an ER doctor was negligent, it is highly possible that the patient can sue the hospital for his or her pain and suffering. If the doctor is known to be incompetent. Whether the doctor is part of the hospital staff or an independent contractor, evident and documented negligence preceding employment often gives grounds to press charges against the hospital for the physician’s incompetence. It is the responsibility of the hospital to keep incompetent or dangerous practitioners out of its employ, so the act of hiring someone with a known history of negligence could result in charges against the hospital. Moreover, if a once competent doctor has developed harmful or negligent practices within his or her tenure at the hospital, it is the hospital’s responsibility to deal with him or her appropriately. Failure to do so can leave hospitals open to lawsuits in the event of a physician’s incompetence. Medical malpractice laws are some of the most complex civil claims. The field of medicine is highly regulated, and a complex system of rules is in place governing the practices and procedures surrounding this field. Hospitals especially have extremely intricate governmental systems and shields to protect against liability. Therefore, if you or a loved one has been injured and you believe the hospital is at fault, consult a representative with extensive experience in malpractice law, like Honolulu attorney Dennis W. Potts. Contact his office at (808) 537-4575 and get the relief you deserve from one of Hawai’i’s leading medical malpractice attorneys.